Prepare to get even angrier about the expense of the Northside Drive pedestrian bridge than you already were: turns out it’s several million dollars more expensive than we thought. The City of Atlanta’s “Open Checkbook” site is now online and many people are looking through it to see what we’ve been spending our money on locally for the past couple of years. FIRST: Bravo to the City for putting this site up and increasing transparency. SECOND: Prepare to get even angrier than you already were about the gleaming tapeworm that we know as the Northside Drive Pedestrian Bridge for the Mercedes-Benz Stadium. We thought it was already worthy of enough scorn due to its $23 million price tag (and, you know, being a ridiculous thing in general versus a street-level fix). Turns out $23 million was an understatement of the cost. 1) Through the end of 2017 Atlanta paid $10.9 million – the original amount authorized by council from City funds. There was supposed to be another $2 million from GDOT. 3) Since then we’ve paid at least another $6 million, bringing the total to over $27 million! None of the spending appears to have come from GDOT, so we’re footing the bill completely. And none of this appears to include the cost of the initial design work by architects CallisonRTKL, so who knows if $27 million is even the end of the story here. This is a case of Atlanta learning a very expensive lesson. We need to prioritize actual pedestrian needs and good urban form with our public spending, rather than showy efforts towards building “world-class” monuments. As ThreadATL’s Lauren Welsh wrote earlier this year about the bridge — let’s be honest: this is about the Super Bowl. The city is talking about spending more than twice the cost of the SunTrust stadium’s bridge in Cobb County — which crosses over 8 lanes of controlled-access interstate highway. And we’re doing so on a stadium bridge that crosses only 4 lanes of a city street so that we’ll have something fancy for Super Bowl 2019. That’s how the City wants to impress out-of-town visitors. Not with our civil rights legacy, our cultural icons, our southern soul food, our urban tree canopy, or our welcoming diverse people. Instead, we believe tourists will think Atlanta is awesome because we have a snakeskin light-up bridge to cross a 4-lane road. If we want to impress visitors, we should invest in useful sidewalks, a functioning transportation system, our many derelict iconic civil rights locations, and plans to help those experiencing homelessness find a place to live. Tourists don’t love cities because of glitzy projects — like residents, they love cities for their life and culture at the street level. As I said, this is an expensive lesson in priorities for the city. And unfortunately, it just got even more expensive. Let’s wise up, Atlanta, and focus on making strong neighborhoods rather than making a big show for visitors through wasteful projects like this stadium bridge. 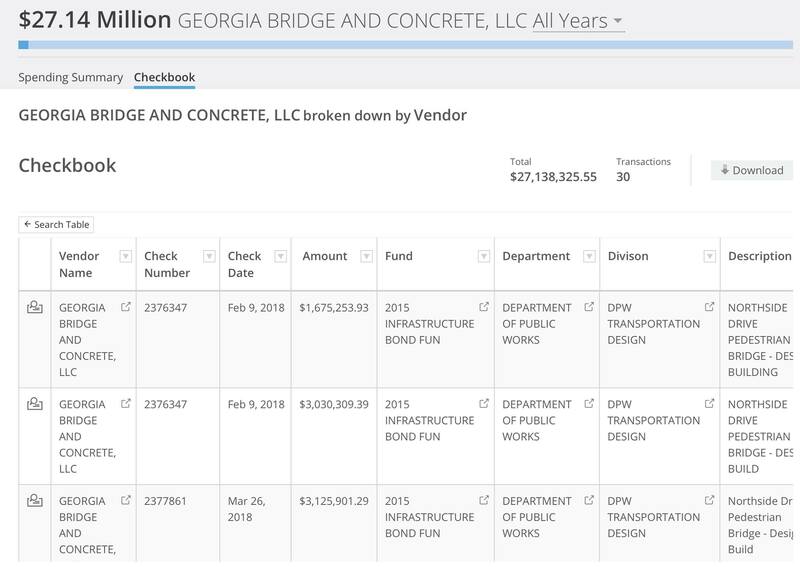 UPDATE: to add insult to injury, we now know that the cost of this bridge is one of the reasons that the city’s Renew Atlanta projects, such as our much-needed Complete Streets redesigns, are short on cash and need to be re-prioritized. Read about that issue here. Previous Previous post: SLOW DOWN the Gulch deal, City Council. This is too important to rush!